Despite a satisfactory GDP, the Indian economy has been sluggish with relation to job creation. 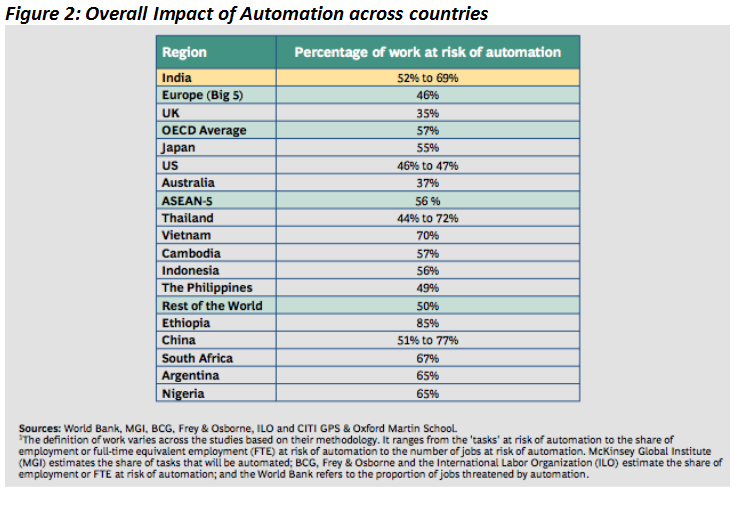 Accelerated pace of automation, coupled with “capitalization” of production systems have been the core factors that have significantly contributed to the reduction of economic opportunities in India. 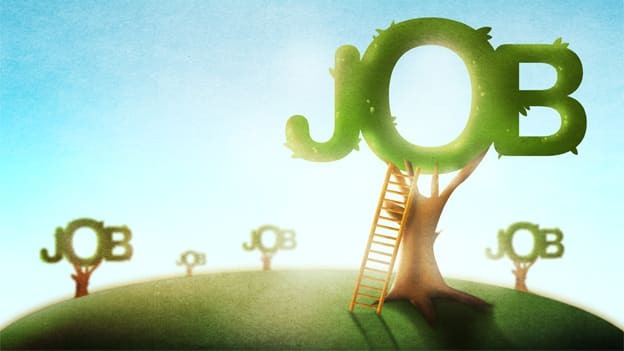 With a job creation rate of only two-thirds of the global average, India’s employment elasticity, a measure of how employment development responds to GDP growth, was around 0.3 between 1991 and 2007 according to the International Labor Organization (ILO). This indicates that 1 percent of overall economic growth created only 0.3 percent employment growth — and the figure has further gone down to 0.15 percent. Another factor that has given an impetus to such a state of affairs is rampant restructuring in several industries that has resulted in layoffs and the subsequent reduction in job growth. This is becoming the future in which projects could be driven largely by automation and robots could put an end to the aspirations of millions of young men and women joining the workforce every year. In India, the next wave of job losses is expected to happen in three key services sectors — IT/ITES or software services, telecom and BFSI (banking and financial services). It is presumed that these sectors will slash nearly 1.5 million white collar jobs in the coming 12-18 months. IT/ITES sector alone, during the period July-September 2016, has seen 16,000 job cuts due to automation and the shift away from outsourcing — these facts revealed by the Quarterly Employment Survey. The Telecom sector that today employs 2.2 million jobs directly and 1.8 million jobs indirectly is set to shed 1/3rd of its current jobs due to consolidations happening in the sector. Banking too is going through a similar phase and layoffs have been regular in the last two years as automation is driving shop floors across the world with robots replacing workers in the ratio of 1:7. Even the startup ecosystem is in a lull as they have not been able to pick the pace and have in fact contributed to the layoffs in the recent months. According to an analysis by Techcircle, since August 2015, over 10,000 people have lost their jobs in the Indian startup ecosystem. Many analysts predict that the Indian economic growth will revive in the next six to nine months; however, they also agree that it is much harder to see the impact of this revival on jobs in the short term. The areas that will see higher job growth will be those that require niche skills. Manpower Group India MD, AG Rao states that, “There will be a great demand for high-skill jobs for the new positions created by automation." And this will be the bright side of automation as the process will create niche opportunities that require specific skillsets. In the IT/ITES sector there will be opportunities resulting from the shift to GST. In a recent interview, Saugata Bhattacharya, Chief Economist at Axis Bank, shared that 90 percent of companies in India are very ill prepared for this shift. But “This will entail a huge opportunity for domestic IT and that will partially offset some of the issues that their external revenues are now facing. This is probably the equivalent on steroids of the Y2K opportunities that the Indian IT segments captured and leveraged on.” On the same lines, Bhattacharya states that the logistics is another industry that will probably see creation of jobs in the short term. However, the real challenge that needs to be looked at is breaking the jobless growth paradigm (also captured by People Matters in an extensive story). A report produced jointly by the Confederation of Indian Industry and Boston Consulting Group titled “India: Growth and Jobs in the New Globalization” has analyzed and revealed the reasons for low job creation and has made suggestions for how more jobs can be generated. The report suggests that focused technology investments across levels, access to risk and growth capital for micro entrepreneurs, a shift in life long learning and a different approach to labor laws will drive new economic development paradigm. But, sustainable job creation requires a multi-pronged, systematic design and implementation. NEXT STORY: Exit interview or ExiSt interview?